Set of five contemporary large* green Oribe plates in the classic half moon shape. 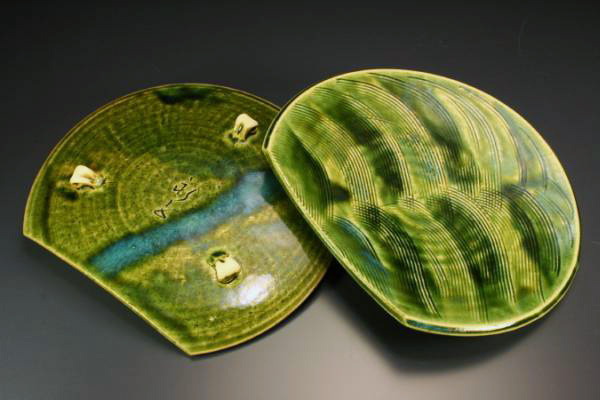 The green copper glaze is variegated and flows across the surface in bold strokes. 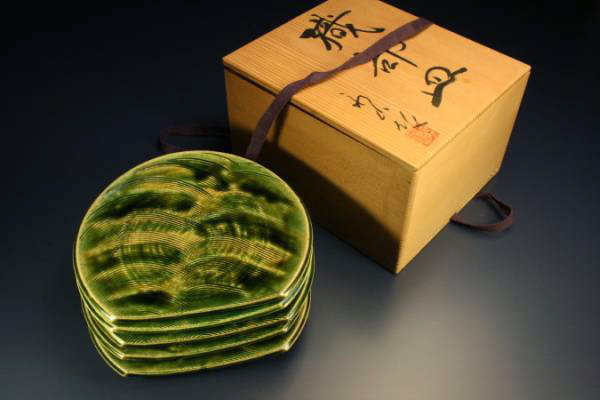 The clay is incised with a combed pattern, adding visual interest. Antique plates do not come in this size, which is perfect for sashimi, tempura (place a raised screen platform if you wish) or even a hassun (assorted appetizer) arrangement. The plates are slightly dished to hold sauces and the clay feet raise the plates elegantly above the plane of the table. Comes with the original box and artist’s signature. *Please note that by large, we mean large for Japanese plates. They are comparable in size to Western salad or dessert plates. Have items in your cart? Mizuya is brought to you by the publishers of Savory Japan. © 2015 Savory Life. All rights reserved.